Have you tried Tunisian crochet before? I hadn't until just recently! I knew that Tunisian crochet used a longer crochet hook, and had something to do with keeping stitches on the hook almost like knitting... therefore, it seemed really scary. But I'm here today to tell you that it isn't scary at all. Boye had given me a couple of their tunisian crochet hooks to try out (they sell an L [8mm], P[10mm] and a Q[15.75]}, so I thought it was a great opportunity to learn how to Tunisian! With the L in hand, I followed an excellent Tunisian tutorial on Crocheting the Day Away. 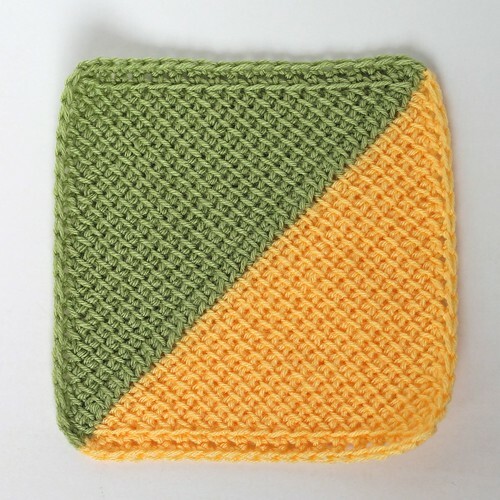 Seriously, if you've ever wanted to learn Tunisian crochet, click here! Following Mary's tutorial, I couldn't believe how easy it was! Why hadn't I tried Tunisian before?! Once I had the basic stitch down, I followed a vintage pattern for an afghan block that I found here, and made the block above. It was made with the basic Tunisian stitch (aka Afghan stitch), and decreasing a stitch at the beginning and end of each row making a triangle, which was then repeated on the other side with the second color. (At least I believe I followed the pattern correctly!) I did find that the edges curled a lot, but blocking it out seemed to help (although you can see the bottom right hand corner curling up a bit). 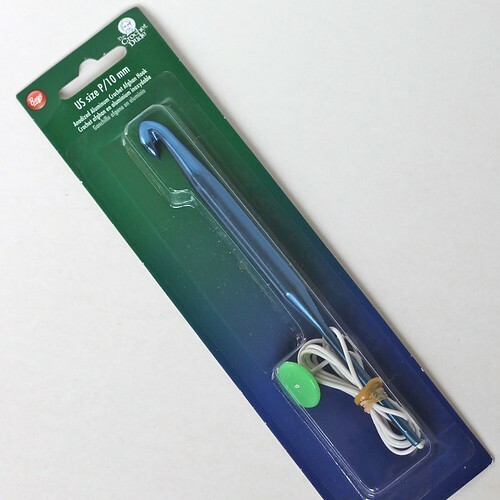 Now I've never used a traditional Tunisian crochet hook before, but I could see how this Boye hook could be a little more portable and storable, and perhaps even hold more stitches on the plastic cable than a longer traditional hook could. It was perhaps a tiny bit more time consuming when I reached the point where I had to slide the stitches from the cable onto the hook, but each time it got a little easier. But overall, I'm excited about trying these hooks out some more with some different patterns! 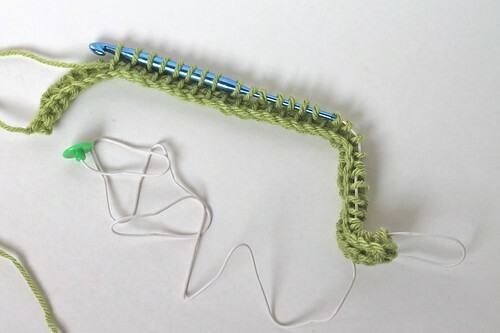 And if you don't have a Tunisian crochet hook, there are still patterns out there using the Tunisian/afghan stitch with regular crochet hooks; the foundation chains for these patterns are small enough for all the stitches to fit on your regular hook (like in this pattern on the Lion Brand website). Have any of you done Tunisian crochet before? If you have I'd love to hear any tips you have, what your favorite patterns are, and what size hook you like to use with what yarn! Very nice! I've been a little curious about it too, but like you, I feel a little intimidated. Your piece looks wonderful! Thanks for the link...maybe I'll get up the courage to give it a try! It's such fun to try something new - even though it looks fiddly with that added piece of wiring attached to the hook. It reminds me a bit of circular knitting which I never quite managed! Glad to see this kind of crochet working so well for you! I'm curious to try now...I have a tunisian hook gifted from a friend of mine, so....it's only a question of time!!! My thoughts exactly! I used to be scared of it and then I tried entrelac crochet. Yes! I've run across a lot of lovely entrelac patterns... I'm dying to try some more!!! Good for you trying something new... you have edged me slightly closer to trying this technique. I did not know you needed a special hook, so I have learned something new today! Thanks for sharing! Your tunisian crochet is absolutely gorgeous! !